(July 30, 2008) Earlier this week the Charlotte City Council adopted a Resolution of Intent to Annex six unincorporated areas of Mecklenburg County. This set in motion a series of events that likely will result in the southern part of Berewick, Williams Glenn subdivision, and other areas of Steele Creek to become part of Charlotte on June 20, 2009. In order for cities in North Carolina to annex areas involuntarily, they must meet two general criteria. The first is that at least one eighth of the boundary of the area to be annexed must be contiguous to the current city limits. Over half of the boundary of the Berewick Annexation Area is contiguous to the current city limits. The second is that the area must meet certain development criteria that demonstrate urban character. City planners have determined that the developed portions of the area have a population density of 2.59 persons per acre, which exceeds the minimum requirement of 2.3 persons per acre. Additional undeveloped area can be annexed if it does not exceed 25% of the total area. Thus a large undeveloped parcel east of Steele Creek Road also qualifies for inclusion. The city also must prepare a report that describes what city services it will provide and how it will pay for these services. The report also must document how the area qualifies for annexation under state law and provide maps of the area. This report is available here: Berewick Annexation Summary Report. Charlotte follows a regular cycle of major annexations every two years. Assuming state law doesn't change, annexation of the Berewick area almost certainly will occur in 2009, but since no other Steele Creek areas are included in the current Resolution of Intent, no other areas would be annexed involuntarily until at least the next cycle in 2011. As development continues in Steele Creek, Charlotte will annex more and more of it until no unincorporated area is left. This may take a while, but is inevitable. 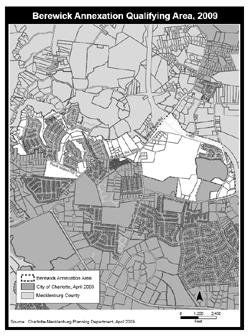 For more information on Charlotte's annexation plans and procedures, visit the Annexation and the 2009 Qualifying Areas pages on the Charlotte-Mecklenburg Planning Commission web site or contact Jonathan Wells at 704-336-4090. For a discussion of city services as it affected the 2005 annexation, see How to Make the Most out of being Annexed (July 3, 2005).